The Governing Body is an integral part of our school structure. They work with the Head teacher and staff to make sure it provides high quality education for all our pupils and constantly strive to improve. They’re involved in decisions about all aspects of managing the school – such as running buildings and budgets, supporting staff and setting standards of school discipline. Governors also help to make big decisions about the school’s long-term goals. The Governing Body acts as an important link between the school, parents/carers and the local community and forms part of the education partnership responsible for providing the best possible education for the children in Arundale. Maintaining this important link will ensure Arundale Primary School continues to be a thriving and successful school. Arundale is a very happy and exciting place with wonderful staff who do their very best to give the children the skills and confidence to reach for the stars!I know this because I’ve been a governor here for more than 10 years and have seen the school develop a wide range of teaching and learning opportunities through excellent classroom practice to support academic attainment and delivery of a range of activities - including our exciting Forest School programme - to support the development of life skills as our children develop as citizens in a rapidly changing world. Arundale continues to work in close partnership with other schools and with lots of groups as an important part of our local community. My work and volunteer activities (including as a Department for Education as a National Leader of Governance) help me to support the school’s leaders through effective governance. Our governance team is strong and we work hard to play our part in ensuring the best possible outcomes for all of our children. I am currently chair of the board and of the Finance Committee. I have worked in Hattersley as a teacher, Deputy Head and Headteacher since 1993. I am proud of the work that our school does with children and within our community. The things that I like most about our school are the people, staff and parents (children too!). I am very proud of the wide range of activities that we involve the children in at Arundale. I am proud to have worked at Arundale since September 2011 and I am really enjoying getting to know the children and parents. I previously worked as a teacher at schools and children's centres in Greater Manchester. I am excited about the opportunity to be part of the Governing Body at Arundale and to contribute to the development of the school. I am a working mum of two children. I have been a parent governor since 2015 and have a keen interest in continual improvement of the school, especially around children with additional needs. I am a parent governor at Arundale Primary School. I have a keen interest in education and safeguarding. I want to ensure all young people feel safe, secure and valued during their time here. I have taken on the role of Safeguarding Governor and Looked After Children Governor to help ensure just that. We can not underestimate the vital role education plays in helping children and young people become successful, contributing adults. I hope to help in this transition, giving our children good self-esteem, self-worth and identity, being empathetic to others, with a strong sense of right and wrong. I have been a governor for 14 years. 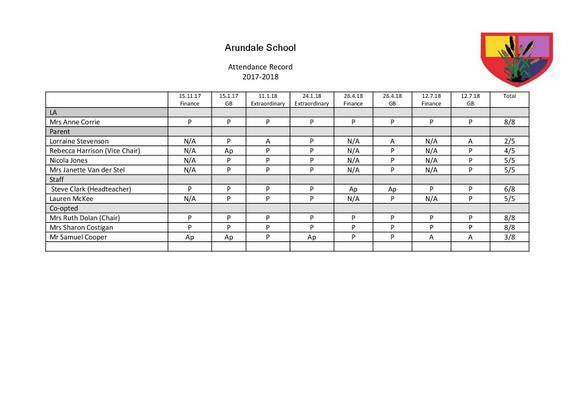 I have worked at Arundale for 19 years and have held different positions within the school. I have enjoyed being part of the school team and governing body that has seen the school go from strength to strength to be in the position that it is today. I enjoy representing the parents and children of Arundale. I have been a Governor for many years. I am particularly interested in how children learn to read and I am particularly delighted to see that school teaches Phonics in the way that it does.